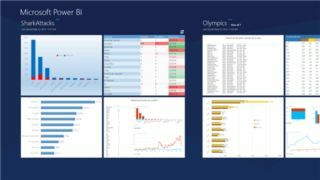 Microsoft has revealed details of the new tools to come for its Power BI service on Office 365, including a natural language Q&A and the ability to type in queries for analysis. It has made the sign-up available for a preview version of the business intelligence service, following the announcement of the plan at the Microsoft Worldwide Partner conference In July. Those now available include includes the Power Pivot and Power View tools in Excel 2013, along with BI Sites, a SharePoint-based cloud service for sharing reports and queries, and browser and tablet tools on which they can be viewed. A natural language Q&A tool is due to become available in September. Initially it will only work with pre-populated sample data, but from November it will be possible for users to load their own data for analysis. They will be able to type in queries such as "product profit by date" and "customer revenue June vs July", and Q&A will pick the most appropriate chart or graph to display the data. There are also plans to provide more 2D features for Power Map and to make the BI Sites function more powerful. A tablet app for Windows 8 and Windows RT is due to be made available on the preview version, and there are plans for another to work on an iPad later. Senior Product Marketing Manager Michael Tejedor told TRPro that more features will be added to Power BI during the preview period. "The way services work is once we hit a minimum bar the public preview goes out and we continue to layer in new features," he said. Power BI is scheduled to launch some time after November, when it will be possible to view workbooks sized up to 256MB in Office 365, compared with a maximum of 10MB in the preview version. The move is part of Microsoft's strategy to increase take-up of Office 365 by equipping it with business intelligence tools previously available only on SharePoint. This makes it possible for users to find a useful way of looking at data then share it with colleagues. Check out our look at business intelligence tools for the SMB market.